Socialist theorists and ideologues have never attacked the essential mechanism of capitalism. Although the injustices of the capitalist system have been attacked in volume after volume, and rightly so, they have never even hinted at the usury upon which the whole system is built and from which all the other injustices stem. Perhaps this is because so many Communist leaders are Jewish. Most of the ‘Russian Revolutionists’ of 1917 were actually Jews from the lower east side of New York City. Two hundred and seventy-five of them were conveyed to Russia aboard the S.S. Christiana, led by Trotsky and financed by Kuhns, Loebs, Schiffs and Warburgs. This cosy circle of Jews and Freemasons financed both sides of the Great War. Marx and Engels, two more Jews, wrote the Communist Manifesto on behalf of a secret society calling themselves ‘The League of Just Men.’ This secret society was an arm of the Illuminati, whose power and influence was the catalyst of the French Revolution. 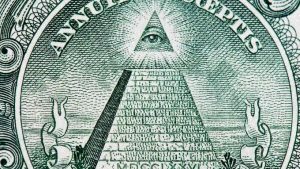 One of the founding members of the Illuminati was the House of Rothschild, the Jewish banking house which practically invented supra-nationalism for personal profit. Nowadays banking has become extremely sophisticated but the hidden and usurious mechanism behind it remains the same. After a big enquiry, hushed up as much as possible, the Bank of England was nationalised in 1946. In theory control of the Bank of England should then have passed from a group of private individuals to the British Government, but this is still not the case. Nationalisation only added a thin veneer of respectability. 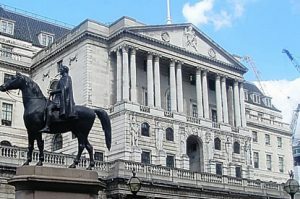 The British Treasury, in conjunction with the Bank of England’s advisers to the Government, determine how much paper money and coin will be issued each year. This has to accord with the wealth of the nation for that year. But because banknotes and coins only account for a tiny percentage of financial transactions, it makes no difference to the bankers at all. 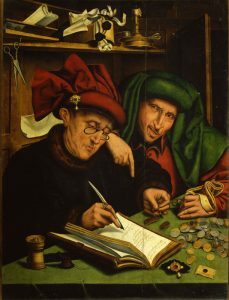 Most financial transactions are carried out with abstract figures on a computer screen that have no relationship to real wealth. Everything has to be paid for at interest though – even when it doesn’t exist! The Government still has to pay interest on old and new loans from the Bank. Only a few years ago it was announced that the interest debt on a loan taken during the Napoleonic War had just been paid off! This is where much of our tax money goes. 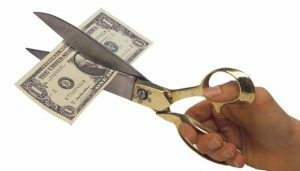 The next stage of development for international finance is to get rid of cash altogether. Then the token accountability of the bankers will disappear along with the cash. Their intention is that everyone will have to use credit/debit cards for every type of commercial transaction. Electronic technology, when used this way, and when it is not merely widespread but compulsory, will give them complete control of every man, woman and child in the world. If you cannot buy or sell – food, petrol, clothes – without a card you are completely at their mercy. If you lose the card or it doesn’t work for some reason you will suffer until issued with a replacement. If you make a protest against some particular injustice they could invalidate your card. The next time you go to the supermarket your card may not work. You won’t officially exist! Who benefits from such a scheme? The politicians or the bankers? To ask the question is to answer it. The Bank of England is the real, but hidden, government of the country. The Government and the politicians are merely puppets controlled by the Bank – or, more accurately, the international banking families. None of our cowardly politicians dare stand up to these hidden and unelected rulers of the world, so powerful have they become. Two American presidents, possibly three, were assassinated for attempting to do so. It is far easier for them to submit to the system and enjoy a rich life than expose the real tyrants: tyrants who cause high taxes, unemployment, war, famine and misery for the rest of us. But these despots of the New World Order forget that Truth is more powerful than they could ever become. And Truth brings Justice! The pen is mightier than the pound! This article first appeared in issue 5 of ‘The Anvil,’ published by The Third Position, BCM ITP, London, WC1N 3XX.